As I’ve noted before, with the FDA deadline just days away at the time, the 2016 IPCPR Trade Show saw a flurry of new cigar announcements, as expected. Pete Johnson’s Tatuaje was no exception. And I don’t think I have to go out on a limb to say fans of Tatuaje were most excited for the new Tatuaje Reserva Broadleaf Collection. The Tatuaje Reserva Broadleaf Collection consists of a whopping 100 cigars selling for $1,200, featuring ten each of the six original Miami Seleccion del Cazador (Brown Label) “HUNTER” sizes, plus the J21, SW, K222, and Cojonu 2003 blends. 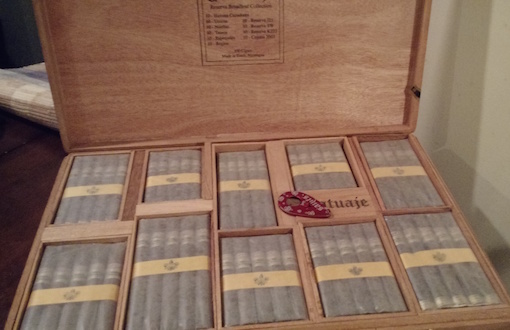 Originally, the cigars were set to only be available in 5,000 master cases of 100 (pictured above). More recently, though, Tatuaje has announced some will be released in boxes of ten of each size. The master cases of 100 began arriving at retailers earlier this year and StogieGuys.com secured one. In addition to master cases of 100, Tatuaje owner Pete Johnson announced this year that the cigars will also be available in boxes of 10 of each vitola ($140 for the K222 box of 10). In March, I reviewed the lonsdale-sized (6.4 x 43) Havana Cazadores vitola. Today, we evaluate the toro-esque K222 (5.9 x 52), the most recent addition to the Brown Label offerings. The original K222 was released last year as a tribute to Pete Johnson’s late dog, Kona, who passed away at 2:22 PM on April 26, 2015. That version features a dark Ecuadorian Habano wrapper around Nicaraguan binder and filler tobacco. The Broadleaf Collection edition swaps out the Ecuadorian Habano for Connecticut Broadleaf. To differentiate from other Reserva lines (including the original K222, which also uses the Reserva secondary band), the Broadleaf Collection bands say Broadleaf below Reserva on the second band. I smoked four K222 Reserva Broadleaf Collection cigars for this review. The deep brown wrapper has just a little oil. One of my samples featured some oversized veins running from the cap to the foot, but all four exhibited excellent combustion qualities. Once lit, I found a cigar heavy on tannin and oak notes combined with a roasted flavor that reminded me stale coffee. Through the 90-minute smoke, I also found bread and black pepper notes. The K222 Reserva is strong and full-bodied, but neither balanced nor complex. I frankly was underwhelmed by the cigar, which caught me by surprise since I gave very high marks to the original K222 and the previous Broadleaf Collection (Havana Cazadores) I reviewed. Maybe the explanation is that this is more an experiment than a polished blend, as the original K222 was clearly blended for the rich Habano wrapper and not a Connecticut Broadleaf wrapper. Whatever the reason, while hardly an unpleasant cigar, it doesn’t come close to the original K222 blend, nor is it among the best of the Broadleaf Reserva Collection. This is why the K222 Broadleaf Reserva earns three and a half stogies out of five. From unable to do any wrong to just can’t get it right, seems to be the ebb and flow of recent tat reviews…truth probably is somewhere in between…bottom line, is that Pete is and will be a difference maker in the cigar world as long as he wants to be !! !